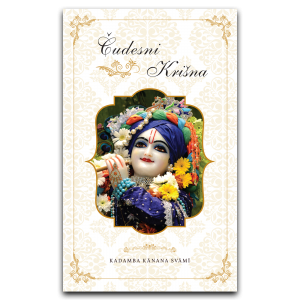 Even before coming to Krsna consciousness, Bhakti-tirtha Swami was not an ordinary person. 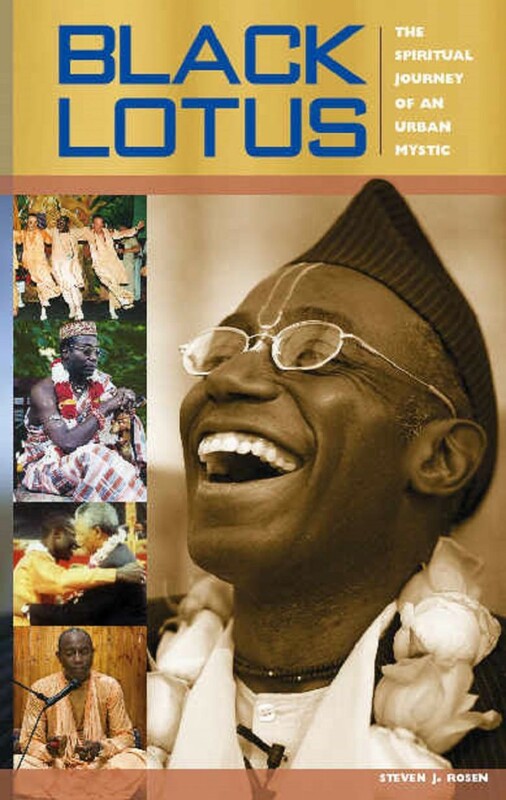 Even before coming to Krsna consciousness he was a public leader at university, one of the first entering an all-white environment, majoring in psychology and African studies. He was the one who was part of the movement that changed America, linking up with personalities like Martin Luther King Jr. Even then he was not an ordinary man, even then he was a leader, the one who was thinking beyond his self-interest. Even then he was one who would look at the benefit of others. Then, after meeting Srila Prabhupada he was sold out and was ready to take any risk for preaching. Preaching behind the Iron Curtain, in communist countries, he was somehow or other trying to put Prabhupada’s books in libraries, sometimes at great risk, like in East Germany facing the notorious stasy (secret police). But somehow or other Krsna protected him on that mission. 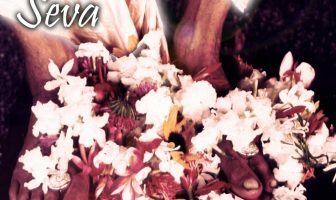 And he was careful to seek Krsna’s protection – by chanting more than the prescribed minimum number of rounds, by really dedicating himself full time. It was not that sannyasa came somewhere later on as an afterthought, rather it was within him all the time. Because all along he had that extraordinary eagerness, a force greater than what the others showed – in his sadhana, in his preaching, in his dedication. Not surprising that he took sannyasa. One of the things he was famous for was being a dancer. He would dance! 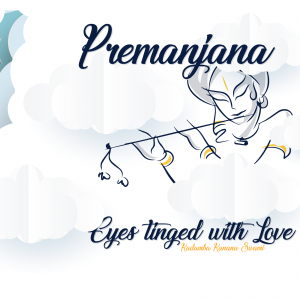 One thing about his dancing that always struck me – because I was there so many times when he danced in South Africa in Ratha Yatra kirtans – but the thing was that he never danced alone but somehow engaged everyone, taking us by the hand. I was there so many times, and it was so typical for him that he would take us by the hand and make us run forward and backward, because he was so inclusive. Everyone was moving! Or driving the gurukula boys mad in Mayapur. He was an original thinker, say a free spirit if you like. A man who worked by inspiration and from the heart. That was not always understood. I remember his cane with the lion head – not everyone liked it. I did! And when he was told that it was not suitable, ah, I dreaded that day! But that cane was just perfect – a cane with a big lion mouth right there in a front. I liked it! So he was ready to embrace people, to be one with them. He went to Africa. He took sannyasa from Kirtanananda Swami who had his history, a different side to his nature, and there was a friendship between the two. 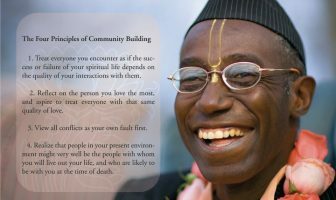 So when ISKCON leadership dealt strongly with Kirtanananda Swami due to his activities and decided to expel him, Bhakti-tirtha Swami did not like it. He would have liked another approach, an approach to make him turn around, an approach to bring him back in and as a result Bhakti-tirtha Swami left. He did not leave ISKCON but he left America and went to Africa, alone, to no man’s land. In Nigeria, Ghana etc. there were no devotees – he was the only devotee in these places. 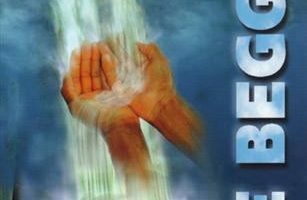 But somehow or other he turned it around and connected with people so deeply and was ready to reciprocate. He was made an honorable chief and he wore an honorable dress. At that time he also created his Institute for Applied Spiritual Technology in Washington DC. I also went there. He became so close to the people he was involved with by extending himself completely to anyone and everyone. Any outsider could see that here is a saint, here is a wonderful person because he was emanating love. That was everywhere. Thus, what he did in Africa was not only creating a few followers by initiating a few people, but he turned the minds of heads of state. He was able to create many temples at that time, all alone, and now his sannyasa disciples who are now leading, are all from there. In South Africa he was dancing in Soweto, a place where there is a history of bloodshed and violence due to racial oppression. 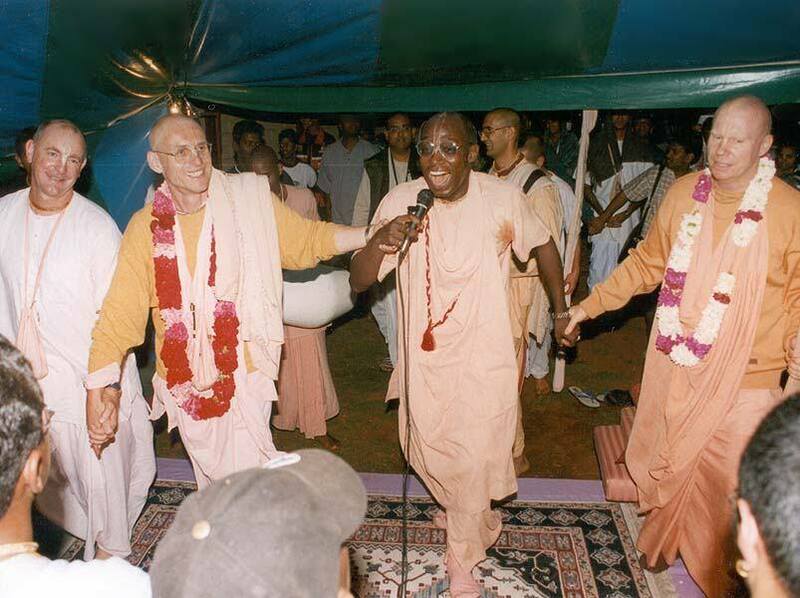 So Krsna consciousness coming with Bhakti-tirtha Swami to Soweto was not a timid appearance. It was really a victory march or victory dance rather! Everyone danced and he danced in front and everyone knew how to dance and jump. But that was just like in the case of Caitanya Mahaprabhu dancing in front of Jagannatha at the Ratha Yatra in Jagannath Puri when he jumped way above the crowd and everyone was just looking. People were saying, ‘Who is that man! ?’ His life was also, just like that dance in Soweto, a victory march in so many areas. He created this incredible sense of community and doing it all together on our way back to Godhead. So in this way his life was a great victory, no doubt about it. 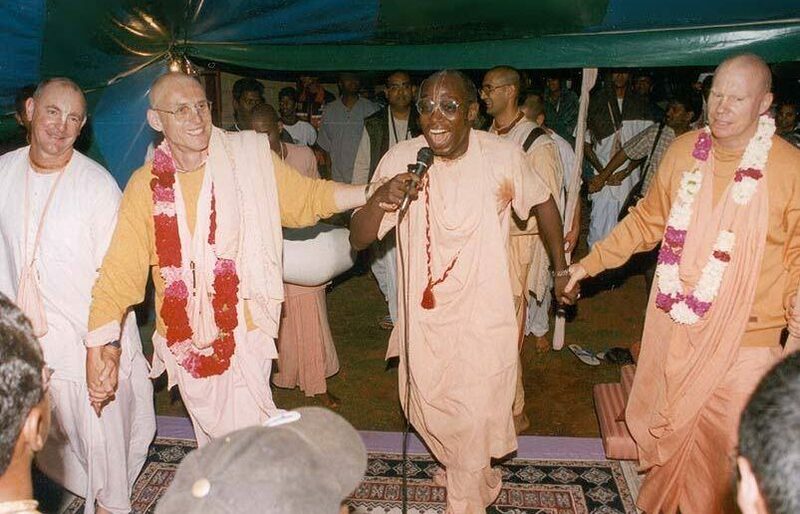 But yet we see that he gave up all these things, his previous identities, as he wrote in his last Vyasa-puja offering to Srila Prabhupada, ‘Goodbye Johnny Boy, John Favors, Abdul Toshombe, Ghanasyam, Bhakti-tirtha Swami, Swami Krishnapad…’ He was saying goodbye to all his identities! And that is death, that one has to say goodbye to whatever and it does not come as nicely as one plans it. Death comes in its own way and it just takes away. It took away the foot of a dancer – what can we say? But he was not defeated by his own slot of destruction, because even while leaving he left by bringing everyone together. Never have we seen such a departure, where someone brought everyone together, sharing his last moments with so much depth and so much love. It was just extraordinary! And there also we can see again that he was victorious over death, entering into the pastimes – maybe pastimes with Prabhupada, maybe pastimes in the spiritual world, or maybe both! In the spiritual world dancing in the dancing competition, surely now with spiritual feet, jumping higher than ever. And yet also somewhere with Prabhupada again, as one of Prabhupada’s trusted men upon whom he can rely, and to whom he can give an impossible order – and it will be done! 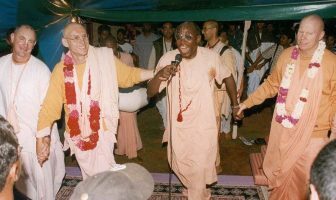 How eager was Prabhupada to hear the reports from Ghanasyam about his preaching! Srila Bhakti-tirtha Maharaj, ki jaya!